Romanesco cauliflower, what’s not to like? It’s bright chartreuse color, treelike shape, and dark green (edible!) leaves are a feast for the winter-weary eye. 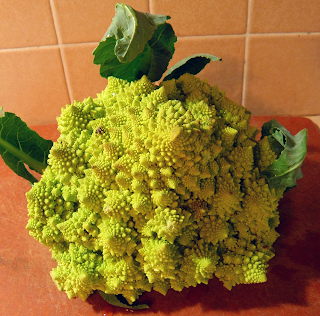 And it’s the only fractal vegetable that I know of. Go ahead and get out the magnifying glass. You’ll see the pattern, technically a recursive helical arrangement of cones, repeat down to the smallest segment. Since a vegetable has a finite number of cells, this is an imperfect fractal, but more precious than a perfect computer generated fractal because it has power to nourish our bodies as well as our minds. The first time I prepared Romanesco cauliflower, I used a cauliflower-tomato recipe. I think it was from the Live Earth Farm website, but a search did not reveal it. In remaking it, I chose oregano, which compliments tomato, and marjoram, which compliments cauliflower, as my main flavoring herbs. Both combine well with chili powder, which I also added. Since our chili powder is quite sweet and mild, I added cayenne pepper for extra zip. The small amount I used is only slightly noticeable but, according to my husband, the perfect touch. Use as much or as little as you like. 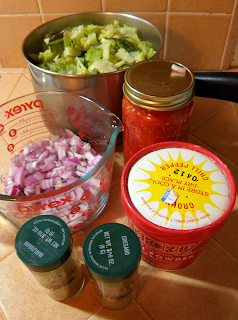 I used young red onions because I had them on hand (and they look good in red sauce), but you can use yellow or white. If you’re making this in the summer, try substituting some fresh tomatoes from your garden. The success of this dish depends upon the cauliflower cooking evenly without being overcooked, so cut it into same-size pieces that can lie flat in a sauté pan. Cut florets in half lengthwise, so that no pieces are thicker than ½ inch. Length doesn’t matter as much. Cut up the leaves as well. You will have about 9 cups. Chop onion finely. You will have about 1 ½ cups. Mince garlic cloves. Meanwhile, sauté onion in olive oil about 5 minutes, till golden. Add garlic and sauté 1 more minute. Add tomatoes with their liquid, cutting up any large chunks with kitchen shears. Stir in seasoned salt, oregano, marjoram, chili powder, and cayenne. 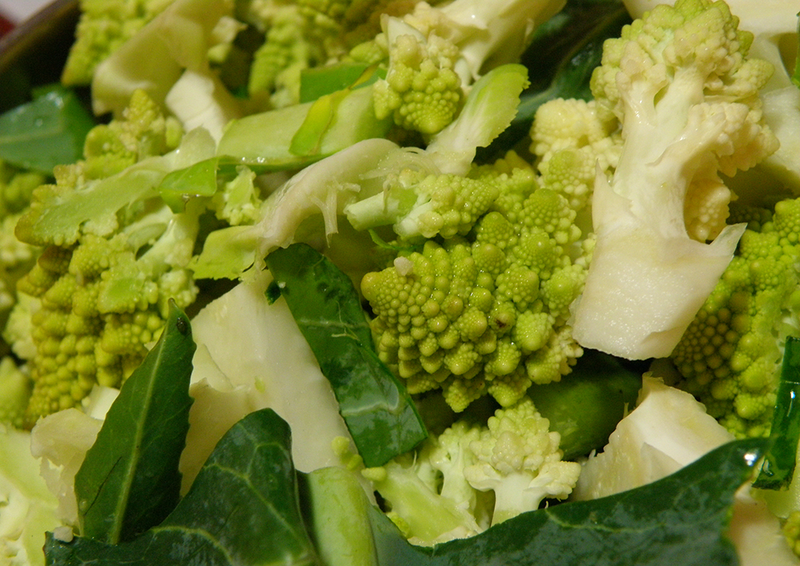 Add semi-steamed cauliflower and stir till coated. 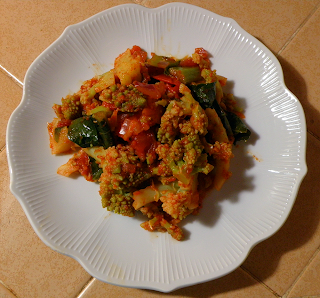 Cover pan and sauté for 5 minutes, stirring occasionally to coat all of cauliflower with sauce and insure even cooking.